Botswana Weighs Lifting Hunting Ban, With Eye On Reducing Elephant Population A government group recommends elephant hunting resume within limits, and also calls for the animals to be slaughtered for meat used in pet food production. 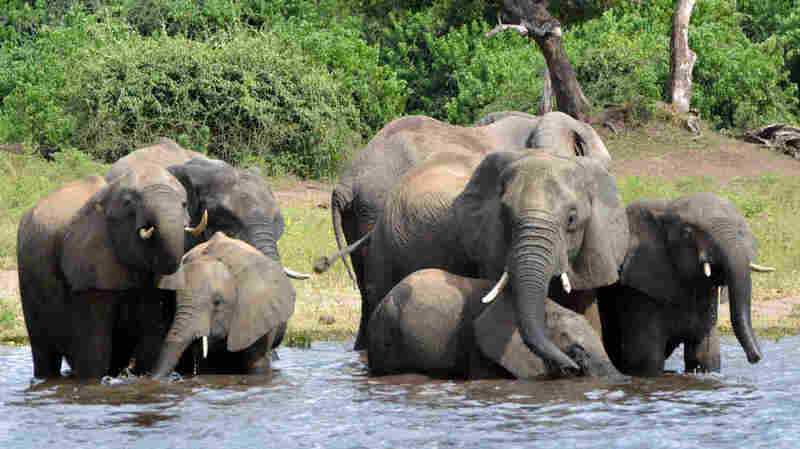 Elephants drink water in Botswana's Chobe National Park. The government is considering lifting a hunting ban to cull the population. Botswana, home to the world's largest elephant population, is moving toward culling the numbers of the giant mammals by lifting a wildlife hunting ban, after a group of Cabinet ministers endorsed the move. In June, President Mokgweetsi Masisi tasked a government subcommittee with reviewing a moratorium on trophy hunting put in place by his predecessor, in 2014. On Thursday the group said it had decided to advise lifting the ban which prohibited hunting the pachyderms on public lands. Frans Solomon Van Der Westhuizen, minister of local government and rural development, said the group recommends allowing "regular but limited elephant culling," as well as creating a legal framework to help grow Botswana's safari hunting industry. The group also recommends establishing elephant meat canning, including for the production of pet food and other byproducts. It would mark a sharp turnaround for Botswana, which has been hailed by conservationists for its robust wildlife safeguards. Former President Ian Khama directed that the hunting ban be put in place during his term. The government said then it was spurred to act after seeing indications "that several species in the country are showing declines." The ban did not affect hunting in registered and private game ranches, where it is strictly regulated under the Wildlife Conservation and National Parks Act. However, even then, the government said the ban would be temporary as it worked to understand "the causes of the decline and where possible, to put in remedial measures to reserve [sic] the trend." Speaking at the Office of the President earlier this afternoon (21/2/19), President Masisi said he was looking forward to reading the report and promised to take its recommendations into consideration. Supporters of the ban say Botswana stands as a success story in protecting its wildlife. But some argue the rules may have worked a bit too well — to the detriment of the animals and people alike. "Some people are worried that elephants have recovered in greater numbers than the environment can sustain, and there is significant concern over increasing human-elephant conflict," says Elephants Without Borders, a conservation nonprofit. "During the past 20 years the elephant range in Botswana has expanded by 53%, causing increasing concern about the impact of elephants on biodiversity, the viability of other species and the livelihoods and safety of people living within the elephant range." Member of Parliament Konstantinos Markus, who has spearheaded the effort to lift the ban, has argued the "expansion of the elephant population in Botswana has impoverished communities." Markus told Reuters that rural citizens have grown hostile toward the elephants especially in the north where he said the crop-devouring animals have slashed maize yields by nearly three-quarters. "This harvest loss leaves the community with fewer options to take care of their households." Yet coming up with a precise tally of the elephant population in Botswana — and even determining whether it is growing — is difficult, in part because herds can cross into neighboring countries, the government says. Markus and other officials have put the number at around 230,000. But in 2016 the African Elephant Status Report estimated the number was somewhere closer to 100,000 and had actually decreased since the last survey was taken a decade earlier. Proponents of lifting the ban also say it would provide an economic boon to Botswana. One research paper published in 2017 found that the moratorium had hurt communities by depriving them of safari tourism dollars and employment opportunities. But Mike Chase, who founded Elephants Without Borders, says "the assertions that elephant hunting is a mainstay and that without it, communities get no benefit at all lacks evidential support. In fact, the impressive growth of the wider ecotourism industry over the last 20 years indicates the opposite." National Geographic says Botswana's photo-tourism industry is much more lucrative than its hunting industry. The decision about whether to lift the ban now lies with President Masisi, who says he is reviewing the group's recommendations. "If need be, we will give an opportunity to Parliament to also interrogate it and allow them space to intervene, before we make a final determination," Masisi said Thursday, reports The East African.